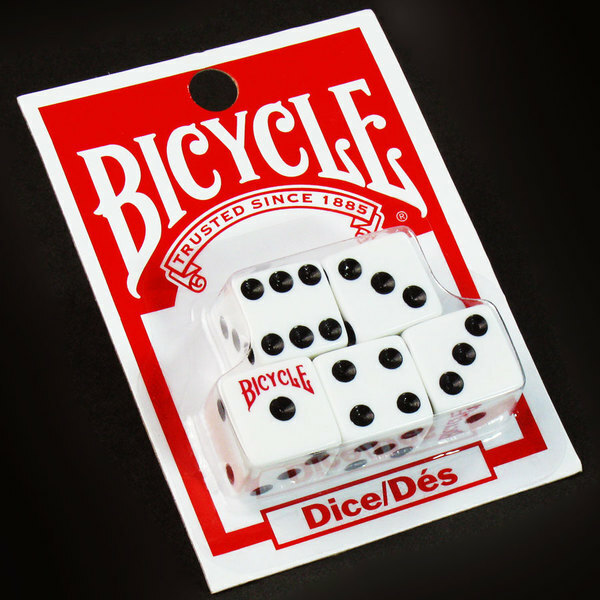 Keep guests at your gathering entertained with this pack of Bicycle dice! A must-have addition to game night at your VFW, American Legion, bar, pub, or private club, this pack of dice brings a professional look and feel to the playing table. Each 5/8" x 5/8" regulation sized die boasts a traditional white background with black dots on each of its six sides for easy reading, and each is also Bicycle branded. Bring a nostalgic and comforting feel and provide your guests with the proper gaming equipment for all their traditional favorites like Zonk, Backgammon, and Craps! Let the good times roll, and stock up on plenty of these packs of dice so your supply never runs low. Great dice! The markings are clear and they seem to be well balanced. I'd definitely recommend them for the price since they are cheap and work well. High quality dice at a great price! I bought them for bunco but I have a feeling my son will be using them for various dice games he plays with his friends while away at college. They are a good to keep on hand for gaming. The 5 pack of dice arrived yesterday and was exactly what i expected it to be. We plan to ise them for board games and fun. The bicycle dice pack is a great pack of di. They come 5 to a pack and you will enjoy playing with these so much! The color is great on these also. Whether you need to replace dice missing from your old board games or if you want dice for playing games of chance, these fit the bill! These dice arrive five to the package, and they are regulation-sized. The Bicycle logo is where the one falls, and these dice can be great for school use, to help solve basic addition problems. 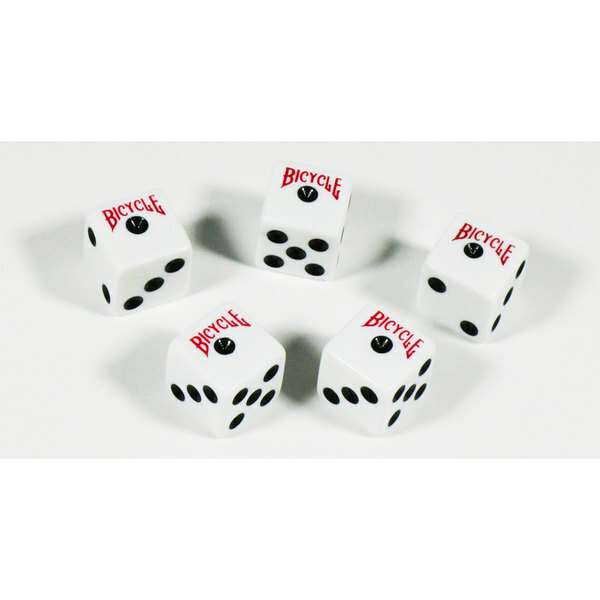 The Bicycle Dice 5/8"- 5/ Pack are a great quality dice. They don't break easily and the colors don't fade easily. The Bicycle brand is a great brand for quality. I would definitely purchase these again. My family plays a lot of board games and occasionally loses dice in the heat of competition. These are great to have around as back ups. 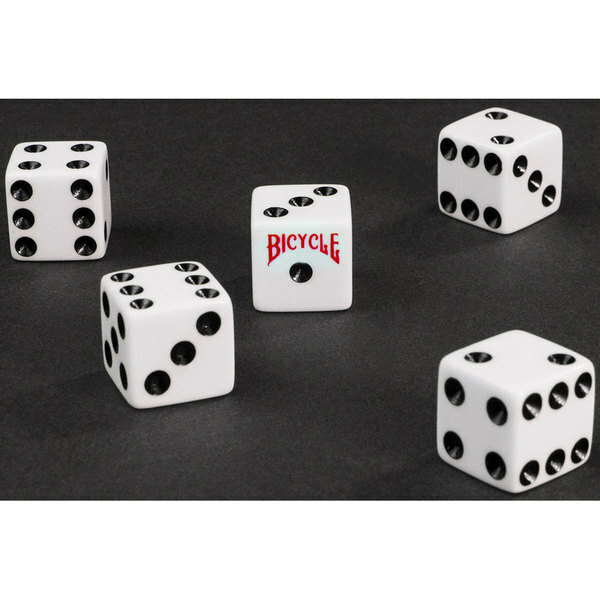 If you love to play games of any kind, you can't go wrong by buying these Bicycle Dice 5/8" five pack of dice. We often lose dice, so to have this pack for this great price is a deal we can't do without. This is a very nice classic dice set. They are regulation size, white with black dots and easy to read. Love the bicycle brand too! The Bicycle company makes high quality cards and dice. Dice are excellent for keeping guests entertained. Dice can be used to play games such as craps and yahtzee. This pack of diced comes with five. We have not found a better price for dice anywhere else..
Great heavy dice at a great price!! I love how easy they are to order and customer service is helpful and sincere. I will order again. The Bicycle Dice was a great find. This is definitely a great deal. You can buy them as a replacement to a game. Over the years my children seem to lose them. The quality is really good as well as the price. Very nice dice product here. My favorite part is the bicycle name and logo printed on the number 1 side of the dice. The name recognition classes this set up. I absolutely love this product! These bicycle dice are great! They came in perfect condition. The feel of them is nice and smooth. On each dice there's a brand written bicycle on them. I received exactly what I expected, 5 dice. They feel properly weighted and of good quality. We have used them for replacements with some of our board games here at the house. Labeled with the well known bicycle brand, these dice are glossy and well made. Very cheaply priced for these quality dice. Good for any dice game you can think of. Bicycle Dice! 5 Dice in the pack, great feel and weight. Easy to use and you can play many types of games. If you lost those board game dice, these are a great replacement for the game at a cost much less then buying the whole game again. These are good quality dice. They are standard size. The black is a nice contrast and there are no rough edges. I will be ordering more of these as replacements for dice lost. These dice are as solid as the brand name, BICYCLE I bought them because they're made by them. Just as if I were to buy a deck of playing cards. They've been around so long that I have come to trust and rely on. Besides the quality of the product, I like the pricing that Webstaurantstore charges. These dice are lots of fun to have. They are the right size with deep and dark markings. The price is right to stock up on these as an add on. What can be better then some games using dice? Dice games and drinks with friends! The dice are quite nice and easy to read. I actually really like the logo on the one dot side. ?? The price and quality of these dice is great. They are large enough to read and small enough to hold in one hand. Fun times ahead with these dice! I really like these dice. They are really big and easy to read. Really nice and well made. Much nicer than rounded edge. The price can't be beat. We keep plenty of dice on hand. 5 packs of Bicycle Dice 5/8" are a good price and easy for us to keep what we need. So inexpensive to have a few extra sets of dice around. Especially in our bar where they get lost a lot and sucked up by our vacuum. Great buy.